Table-less HTML, friendly URLs and host named site collections are the major topics of my presentation in Rackspace’s 1st Week of SharePoint 2013 Webinars. 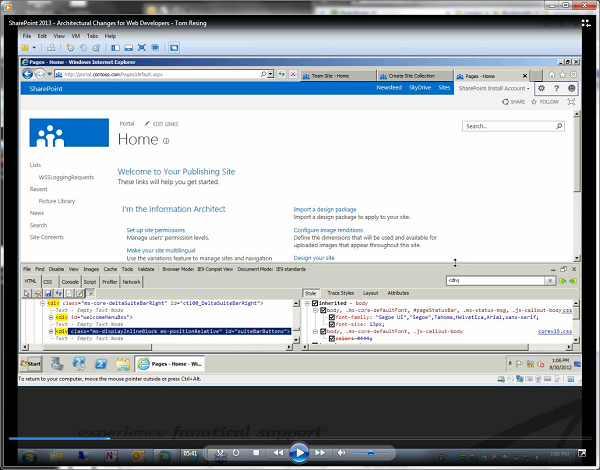 Watch a comparison of SharePoint 2010 HTML Markup to SharePoint 2013 HTML Markup pointing out some areas of improvement with the Internet Explorer F12 Developer Tools. Watch me demonstrate and explain some of the changes in web addresses for pages available with SharePoint 2013 and metadata navigation features. Take a peek at the Central Administration Site Collection creation which is lacking support for the newly improved Host Named Site Collection features and get a look at a great blog post explaining how to do the same through PowerShell. If you have a few hours to dedicate to SharePoint 2013 learning, I suggest watching the whole set of 8 webcasts. Personally, I started from the beginning with Jennifer Mason’s excellent overview of end user improvements and changes. Next, I watched Laura’s Overview of the Social Features. I really liked how Laura built out example sites so you can see what looks like a real-life capture with interactions among team members. I watched all but 1 of the webinars so far and learned something new in each one.